This should be the home of the local matriarch, who is a hagraven. She lives here alone and secluded, sought out by her people when the situation demands it. Maybe this hagraven might be a dilettante, self-taught scholar figure, trying to hack Direnni magick (examining gathered artifacts, most notably a Magus console her tribe scavenged for her from this ruins) for her sinister purposes? I think that's a great idea, and a welcome approach to the good old "evil wizard lair" trope, that are often resorted to in ruins like this. Finally, how big would the ruin be? Since this is a somewhat larger interior, I was waiting for roerich to give his opinion on the claim. Other than that, have it granted? Good luck! This tileset can be tricky sometimes, especially when it comes to transistions between various tile types and ceilings, so don't let that discourage you. Feel free to ask if you have any questions or doubts. Sounds great. I believe we wanted this tribe to have a problem with a wereboar curse spreading, so maybe the mother wants to use Direnni arcane knowledge to cure her tribesmen, and she need player to fetch some stuff how you said? Turning on the player later is feasible too, these guys here are supposed to be nearly savage and definitely not trustworthy. You should wait for roerich with that, but I believe 3-4 Direnni rooms and then a cave-in part would be ok? The cave could stretch under the village, reaching to more hidden Direnni chambers then. Definitely something smaller than whole Mirilstaren complex, but maybe something similar to Amhrotal in size? With different, standard layout of course. 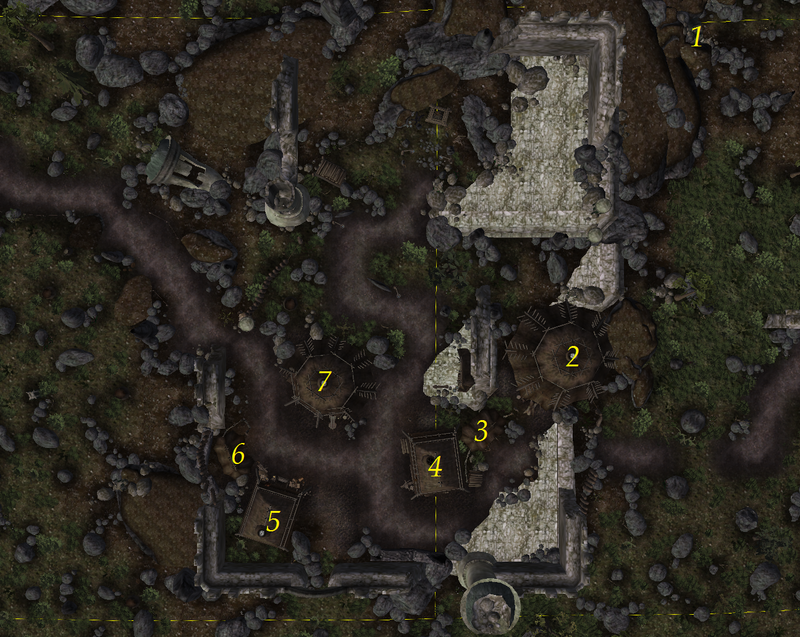 By the way, here's an overview of Direnni ruins of eastern Reach; yours is Vars Tharnil. Ok, i will get to work on this soon! Would it be a good idea to have a cave-in connecting to this interior's basement? (Via a Tribunal 'Dark Hole' door). If i do this, i would also claim that interior. No need for it IMO. We have a lot of these type of subterranean connections already, and adding them everywhere would remove the novelty. I love how it looks already. Good work at figuring out about these tiles and i think i finally realise what's the problem with the staircase. I didn't ever truly stress-test it for these combined usages. I'll see about providing an alternate upper end for the staircase to prevent issues with previous interiors. Update. I don't really have the time for my claims here, so hopefully someone else can finish them. Finished. Great work on this, MinerMan60101. There wasn't much I needed to add. Thanks, I am glad to see this finished. Roerich merged this into the Dragonstar Section file. The bedrooms should be changed, as most of the beds are inaccessible and it feels to cramped, so it should be made into a proper room instead of from hallways. The path through the caverns shouldn't be locked, but the path to the Magus Console should be. The caverns should be looked over to see if there's an acceptable level of detail.